HANOI (15 Dec 2018) – The four-goal first-leg thriller in Kuala Lumpur had immensely raised expectations of a grand finale here tonight. 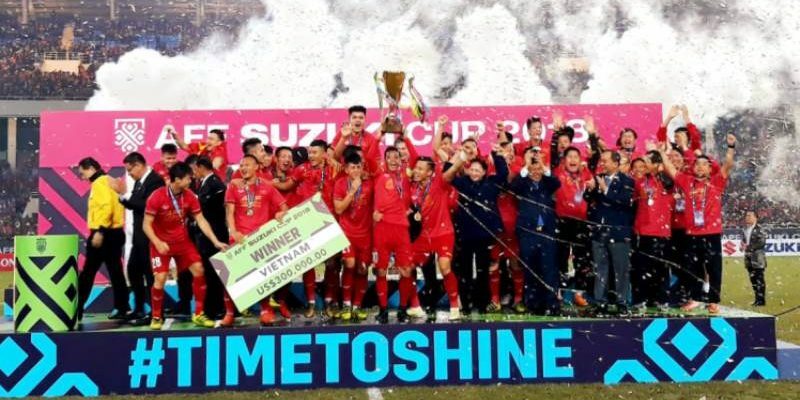 And Vietnam, in front of over 40,000 fans at the My Dinh Stadium tonight, fulfilled the dreams of their fans and deliver a second AFF Suzuki Cup after a 10-year long wait. An early sixth minute goal from veteran striker Nguyen Anh Duc against Malaysia, reduced to 10-men after defender Shahrul Mohd Saad was sent off in added time, was enough to secure a 3-2 aggregate victory for Vietnam. “This trophy is for all Vietnamese people. It is an honour to be well supported and loved by the Vietnamese and also South Korean people,” said Vietnam head coach Park Hang-seo afterwards. The last time Vietnam lifted the coveted trophy was in 2008 when they defeated Thailand, also at this venue. Vietnam are the third most successful team in the history of the regional tournament after Thailand and Singapore, who have won it five and four times respectively. Malaysia have claimed the title once before in 2010. For Vietnam, this was their third ever final while for Malaysia, it was their fourth. Vietnam lost in the 1998 final while Malaysia, in addition to today, had to settle for the silver in 1996 and 2014. Following the 2-2 draw in the first-leg, Vietnam were under tremendous pressure to get it right at home tonight. Adding to that was the fact that Vietnam had beaten Malaysia 2-0 in the group stage and fans would not accept anything less than victory today. The hosts helped their cause when they eased the massive burden by scoring an early goal, just six minutes into the match. Anh Duc caught the defence out and smashed in from close range, sparking off massive celebrations in the stadium which took some time to settle down. They could not have asked for a better start for with the away goal rules, Vietnam could even afford to concede a goal and still win the title. The Malaysians pushed hard in search of the goal and almost found it in the last few minutes of the first half. Defender Muhammad Syahmi Safari let loose a stiff shot but keeper Dang Van Lam punched it away at the top right corner. Some ten minutes after the break, Muhammad Safawi Rasid’s curled his freekick around the wall but it was cleared by Van Lam. The Malaysians continued to hunt but although they were in control the bulk of the game, they were constantly stopped by the solid Vietnam defence. With so much at stake, it was no surprise the game was a somewhat bruising affair with a total of 12 cautions issued. The booked players were Vietnam’s Dang Van Lam (9th), Nguyen Trong Hoang (16th), Tran Dinh Trong (19th), Ngueyn Huy Hung (29th), Doan Van Hau (52nd) and Do Duy Manh (53rd) and Malaysia’s Mohamad Aidil Zafuan (9th), Shahrul (36th and 90th), Mohamed Syamer Kutty (40th), Muhammad Syafiq Ahmad (79th) and Mohamad Zaquan Adha (90th). Just after the match, Mohamadou Sumareh was given the red by referee Faghani Alireza from Iran for abusive language. And in the end, the early strike from the experienced Anh Duc, who at 33-years is the oldest player in the team, turned out to be the winner and steered Vietnam to their second AFF Suzuki Cup crown. “We played perhaps our best game but it was unfortunate that we could not score. We have a lot of young players in the team and it is good for the future,” added Malaysian head coach Tan Cheng Hoe.